Tip: The grilled pork is a winner. We may not have posted in months and we are sorry, but at least we aren't months behind the times like Perth Now. We have been fans of Le Vietnam for a long time, with that review being posted a year ago. 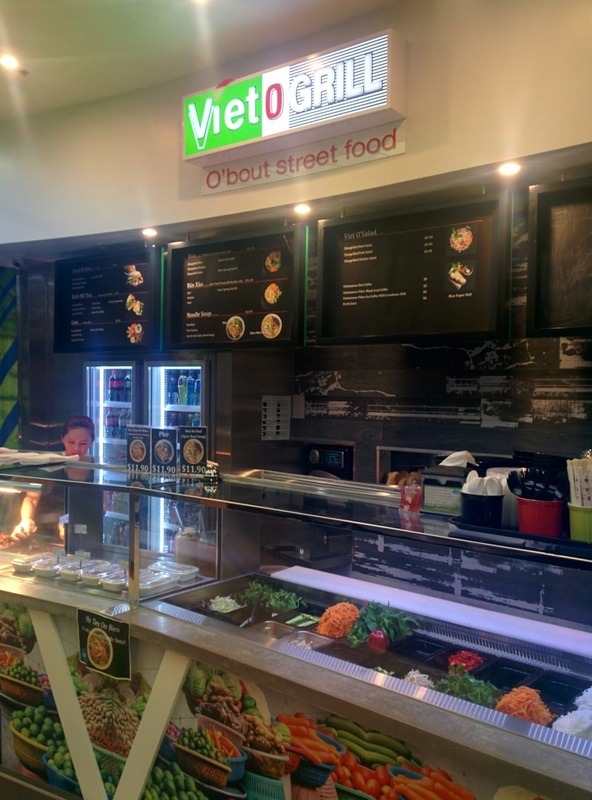 The latest in our Banh Mi chronicles comes from an unlikely source, in the carnage that is 160 Central, a new Vietnamese eatery "Viet O Grill" has emerged with its catch phrase "O'bout street feed". Whilst we weren't exactly full of confidence, we have learnt not to judge a book by its front cover or in this case a suspect name and slogan. The menu was varied and featured your usual Vietnamese favorites of Pho (Noodle Soups) and Bun (Vermicelli Salads). What caught the eye was the Banh Mi Thit at a very reasonable $7.90 with numerous filling options. We were chasing a crispy roast pork number, but unfortunately we were a bit early(11:30) and it was not quite out of the oven yet. We settled for the chargrilled pork. In between getting called "darling" by the lovely Vietnamese lady from Saigon a banh mi was made with the perfect balance of efficiency and care. The ingredients appeared to be very fresh and the bun was warmed in the oven - the boxes were getting ticked. Whilst the photos don't show it, this Banh Mi comes in on the larger scale, about 25% longer than the other Banh Mi's in town. The carrots had the right level of pickle and the coriander, chili, spring onions and cucumber were all very fresh. The pâté was a bit too thin and didn't pack the usual punch you would expect. The pork was delicious and with a strong hint of lemongrass. The baguette was crispy, but I think a little too chewy. 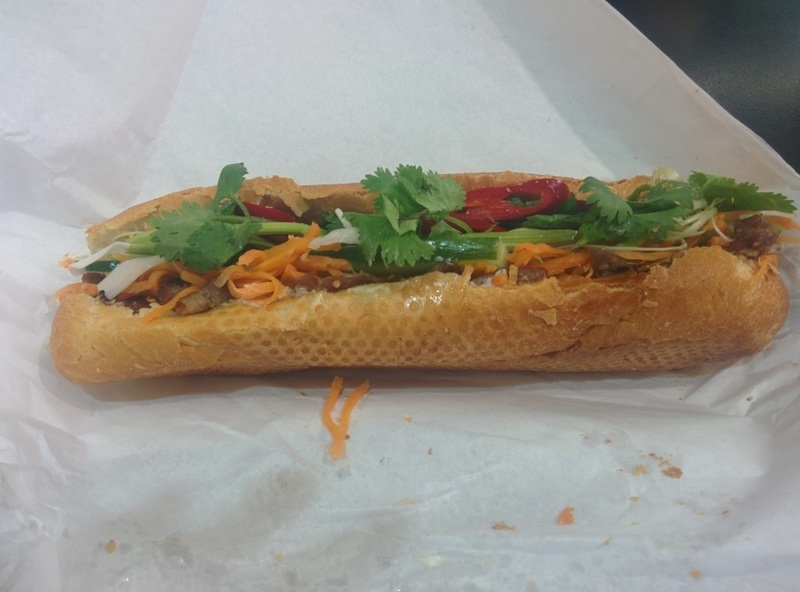 Overall a pretty good banh mi which will hit the spot for the hungrier reader out there. 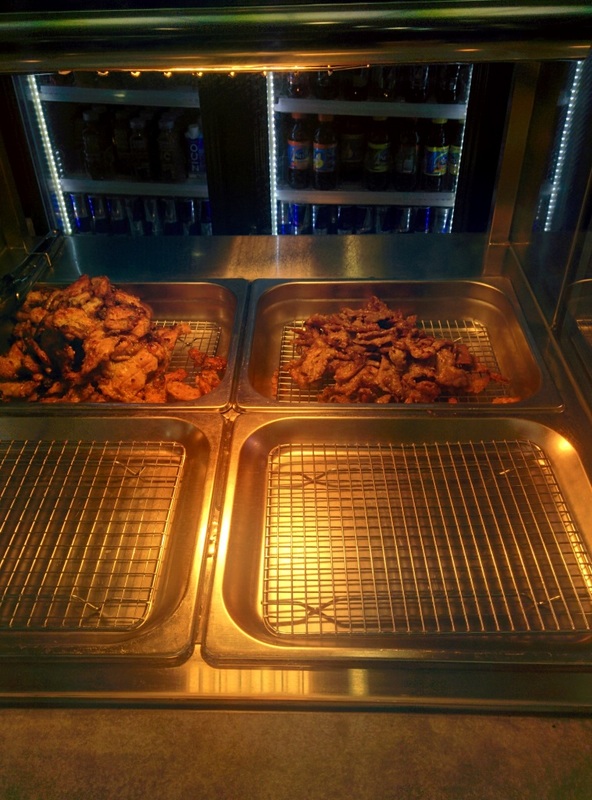 We will have to come back again to check out the Crispy Roast Pork and other offerings on the menu.